Even though Spencer Miliotto thrived in Advanced Placement (AP) English at Kenmore East High School, he wasn’t a big fan of classic literature. His tastes ran more obscure. “I remember reading a science fiction novel about a group of aliens on a hostile planet. It was this book, along with countless X Minus One radio programs and Twilight Zone episodes, that pushed me toward speculative fiction,” said Miliotto, now a Buffalo State senior English education major and Muriel A. Howard Honors Program student. Miliotto, who hopes to lead his own AP English class someday, believes introducing high school students to a wide variety of literature is the way to create lifelong readers and critical thinkers. 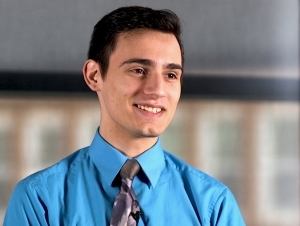 After graduating in May 2018, Miliotto plans to pursue a master’s degree in English education at Buffalo State before hitting the job market. “I knew growing up that I wanted to be a teacher and Buffalo State was the only option as far as I was concerned,” he said. He hasn’t been disappointed. Beginning in his sophomore year, Miliotto gained teaching experience, including landing substitute teaching positions at John F. Kennedy Middle School and High School. He’s now observing an English teacher at Cheektowaga Central High School. Participating in extracurricular activities, such the English Education Student Association, also have been educational. He said he’s had countless opportunities to get involved on campus and in the community. His favorite project was a digital writing workshop for refugee children living on Buffalo’s West Side. He also became involved in the Western New York Network of English Teachers (WNYNET), which hosts speakers series and networking events for local teachers and teacher-candidates. English teachers he’s met through the group have told Miliotto that he may change his mind about what kind of classroom is the best fit for him. He said he’s keeping that advice in mind. However, regardless if he lands a job with honors students or traditional learners, whether in an urban or suburban school, Miliotto knows one thing for sure. He wants to stay in Buffalo and he wants to help the next generation of English students appreciate the written word in all its incarnations. He said his Buffalo State experience didn’t just prepare him to become a teacher; it also helped him discover his best self.